Join Chief Tiger Schmittendorf as he delivers his FDIC presentation “From the XBOX to the Box Alarm Live”, an offline conversation about today’s online generation. During the afternoon, Chief Schmittendorf will talk about how to safely respond to highway / roadway incidents and take a look at the growing number of firefighters who are injured or killed. 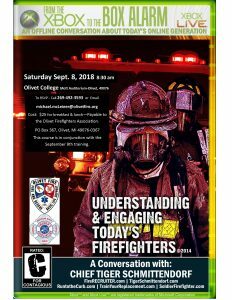 This interactive training will be held on Saturday September 8, 2018 from 8:30 am to 5:00 pm at Olivet College Mott Auditorium, Olivet, MI 49076. Click here to download the course flyer. To place your reservation call 269-492-3593 or email michael.mcLeieer@olivetfire.org. The cost is $25.00 per person which covers breakfast, lunch and afternoon snacks payable to the Olivet Firefighters Association, Inc., PO Box 367, Olivet, MI 49076-0367. The fee for this class is being paid courtesy of the Josh Cellars Training Grant received through the National Volunteer Fire Council. Course sponsors are the Olivet Fire Department, Olivet Firefighters Association, Inc. and the Michigan State Firemen’s Association. Please include “September 8th class” on the check memo line. Do your Recruitment and Retention efforts leave you feeling like you’ve lost the battle and the war? 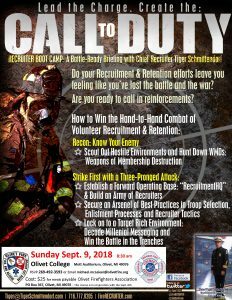 Join Chief Tiger Schmittendorf as he facilitates a conversation titled “Call to Duty – Recruit and Retention”. During the afternoon session, the Chief will facilitate a general discussion on challenges you face in today’s fire service. This interactive training will be held on Sunday September 9, 2018 from 8:30 am to 3:00 pm at Olivet College Mott Auditorium, Olivet, MI 49076. Click here to download the course flyer. To place your reservation call 269-492-3593 or email michael.mcLeieer@olivetfire.org. The cost is $25.00 per person which covers breakfast, lunch and afternoon snacks payable to the Olivet Firefighters Association, Inc., PO Box 367, Olivet, MI 49076-0367. The fee for this class is being paid courtesy of the Josh Cellars Training Grant received through the National Volunteer Fire Council. Course sponsors are the Olivet Fire Department, Olivet Firefighters Association, Inc. and the Michigan State Firemen’s Association. Please include “September 9th class” on the check memo line.